I grew up in Maryhill, with my bedroom window overlooking the Forth and Clyde Canal at Maryhill Road. At that time it was neglected, overgrown, filled in for much of its length and it was hard to imagine it in its heyday. I was warned by my parents never to go anywhere near it when I was out playing. Since then it has been re-developed, all of the discarded cars and washing machines have been removed from it and dog walkers, joggers and cyclists who go along its towpath regularly are seeing more houses and businesses slowly appearing along the banks of The Nolly (as the canal is known). Every other week I wander up to the canal to watch Partick Thistle Football Club play at what has been their home since 1909, beside the Firhill Basin on the canal. I know this stretch well but rarely have cause to go further east from Ruchill, through Possil and Lambhill. Whilst doing some family history research today, trying to track down a gravestone in St Kentigerns Cemetery in Lambhill, I took the chance to spend a morning wandering through Cadder, Lambhill, Ruchill and Possilpark. Work began in 1768 to cut the canal from east to west, work starting at what would later be Grangemouth. It was completed in fits and starts and in 1785 it reached Bowling, on the Clyde, the last section funded with government money raised from forfeited Jacobite estates. It became a way to transport supplies and goods across the country and industries soon built up along the banks of its 35 mile length. However changes in ship design and the growth of the railways soon led to its decline, and after 30 years of near dormancy it was closed in 1962, and some parts filled in. At the time the canal was built much of the area north of Glasgow was farmland, heath and forest. Some sandstone quarries had been dug in the area of Possil Estate to build the tenements of Glasgow. By the mid-1800s these had all been filled in. A new industry started in the Lambhill area in the 1840s when ironstone pits were dug here. With the iron extracted, iron foundries and forges were soon established nearby. The last ironstone pit in this area was the Gilshochill pit, at the western end of Tresta Road just beyond the cemetery, used from 1850-1897 by the Summerlee Iron Company (whose well known works along the canal in Coatbridge are now home to an excellent industrial museum). During World War 1, as demand for iron soared, these Gilshochill pits were re-opened. 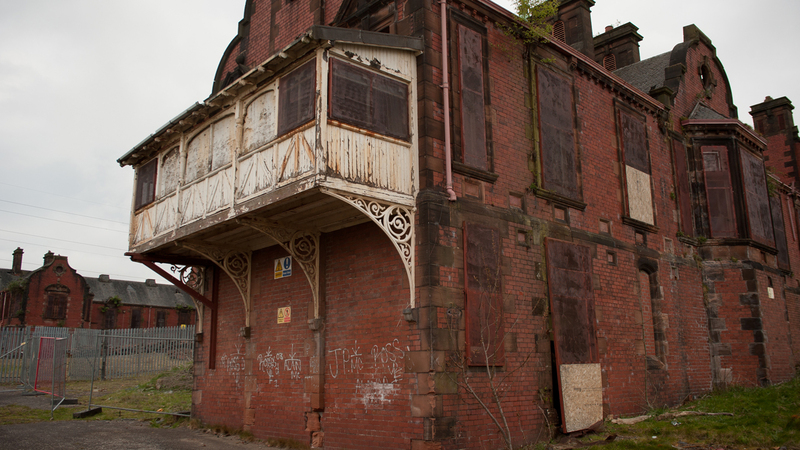 The 180 year old Lambhill Stables are just off Balmore Road where it crosses the canal. They were built as a staging post for horses which pulled the barges on the canal. There was also accommodation here for the bridge keeper who had to raise and lower Lambhill Bridge. The wooden bascule bridge seen in the first photograph was built in 1790 and replaced in 1930 by an electrically operated lifting bridge. Across the bridge from the stables the Lambhill Ironworks were opened in 1880, by R. Laidlaw and Sons. They made pipes, pumps and gas meters. Lochburn Ironworks which opened in 1877 lay further west along this stretch of the canal. They employed 1000 workers making water and sewage pipes. All of these industries have since closed down and been swept away now. Walking along the canal, past the allotments behind Lambhill Stables, there are a couple of paths that take you around Possil Marsh. This nature reserve has been a Site of Special Scientific Interest and bird sanctuary since 1954 . Miners cottages provided by the Carron Company used to lie on the opposite bank of the canal here, called Possil Raw. As you follow the path around Possil Marsh you will come to a stone at its northern end. This is a monument which commemorates the High Possil Meteorite. This is one of only four meteorites to have been found in Scotland. The others from Scotland are the Perth meteorite of 1830, the Strathmore meteorite which fell in 1917 and a meteorite found in fields near Glenrothes in 1998. The High Possil meteorite fell on the 5th of April 1804. Three men working in a field nearby reported hearing a whizzing noise, or the sound of a gong before the thud of something hitting the earth. A group of men working in a quarry near where it landed described hearing this whizzing sound for about a minute, then rushed over to where they saw something hit the ground. At the bottom of a drain they found a stone unlike any other from that area. The owner of the land, Robert Crawford, took possession of the two pieces of stone found and when he died in 1910 his sister presented them to the Hunterian Museum at the University of Glasgow. Bits of it have been distributed to various institutions, including the British Museum, and some of it appears to be available for sale on the internet. The largest remaining chunk of it is still on display in the Hunterian Museum in Glasgow. This stony piece weighs around 150g and although extra-terrestrial in origin, coming from the asteroid belt between Mars and Jupiter, it contains minerals similar to those found in basalt, with 9% nickel-iron alloys. Although it would have hit the atmosphere of Earth at 150,000 miles per hour, the slowing effect of the atmosphere means it would have struck the ground at a few hundred miles per hour. Made of debris from events that formed the sun and the planets, this chunk of rock is dated by radioactive dating at about 4500 million years old. After walking round the rest of Possil Marsh I returned to Lambhill Stables and enjoyed a mug of tea and a lovely bacon roll at their cafe for £2.30. Beside the Lambhill Stables buildings, at the end of Skirsa Street, lies a waterman's cottage built towards the end of the 19th century. The pipe carrying water to Glasgow from Loch Katrine lies under the ground parallel to the road here and was overseen and maintained by Glasgow Corporation waterworks who employed "watermen", housed in a number of houses like this. Across Balmore Road from Possil Marsh lies the largest of the four Glasgow necropoli. The Western Necropolis is part of a cemetery complex which started with Lambhill Cemetery in 1882. St Kentigerns Roman Catholic Cemetery and the Western Necropolis followed soon afterwards. The burial grounds here contains the first crematorium built in Scotland, designed by James Chalmers in 1893. The graveyards contain many graves of soldiers including over 350 World War 1 burials. Glasgow had four hospitals operating as war hospitals to receive hundreds of soldiers at a time from France on special ambulance trains: Stobhill Hospital, The Western District Hospital, Springburn Hospital and Merryflats War Hospital in Govan. Families of those who died whilst in Glasgow as a result of their injuries could choose for their relatives to be buried here. Some of these soldiers were from Canada and Australia. There are also 124 graves here from World War 2. I came here today to find the burial plot of my great-grandfather James Donnelly who was from the Gorbals. As a dentist working at Gorbals Cross (among other things he did) he made gum shields for Gorbals born boxer Benny Lynch, Scotland's first boxing world champion, who is also buried in St Kentigerns Cemetery. 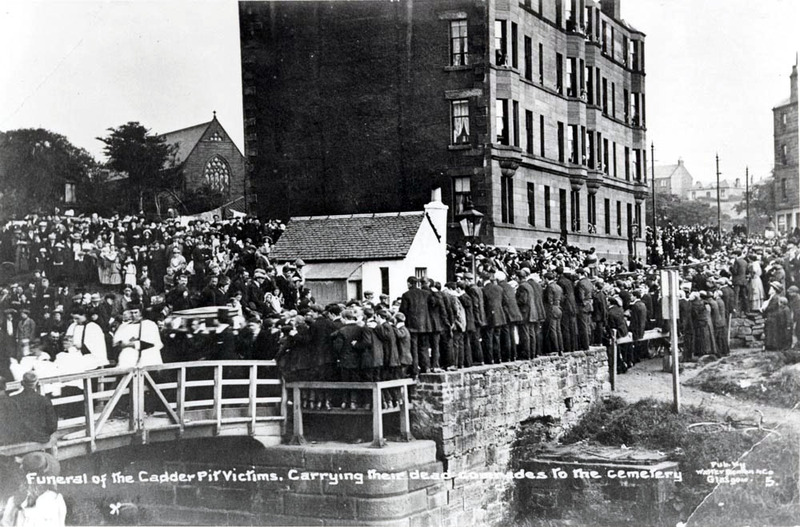 Also buried in the Western Necropolis are the twenty-two men who died from blackdamp as the result of a fire in Cadder No.15 pit, which started on 3rd August 1913. Twenty six local men were finishing their shift when the fire broke out underground. The pit that they were working in went down for 1000 feet and ran north, under the River Kelvin. Coal mining was common in this area at the time after the ironstone was largely exhausted, with pits from Anniesland and Maryhill, across to Bishopbriggs. Thousands of people lined the street to pay their respects as the funerals were held. There is nothing now remaining to show that a major coal mining industry was active in this area. Pit No. 15 was operated by the Carron Company of Falkirk. At its peak it could produce 400 tons of coal per day and 300 men were employed there. The company ran several pits in this area. Where the pit lay is now roughly underneath the waste reprocessing plant on the Balmuildy Road heading towards Bishopbriggs from Lambhill. Leaving Lambhill, if you head down Balmore Road you are soon in Possilpark. On the right as you head towards Glasgow lies the disused Possil train station. This station was opened in 1897, but closed in the Beeching cuts in 1964. In the 1980s and 90s it housed a bookies shop. A scrapyard lies behind the old station building and the building itself is in a bad state of repair, and surely unlikely ever to be restored to its former glory. The lands of "Possele" date back to the 13th century. For centuries they passed through the hands of several wealthy families, many of whom had made their money in the West Indies via the slave economy there. By 1834 the mansion house and lands were described as "...far away from the noise and smoke of the city....as retired and delightful a country residence as any in the country." In 1850 Walter MacFarlane was running a successful foundry in the Gallowgate, on Saracen Lane, behind the Saracen Head pub. He bought 100 acres of the Possil estate including the mansion house, in order to expand his business and build a large new works. He demolished the house and felled the woodland to make way for his new Saracen Foundry. Once railway access was built he created a foundry covering 14 acres and built tenements alongside it for the workforce. A new street, Saracen Street, named after the place his business started, was laid out from Port Dundas up to the grand front gates of the plant. In 1872 10 people lived in the area of Possil, by 1871 10,000 people were living here. The Saracen Foundry became very specialised in fashionable, ornate ironworking. They built bandstands, water fountains, street lamps, railing and bridges which can be found all over Glasgow, Britain and the Empire. After World War 2 new materials and new tastes meant that the business began to struggle. Despite being one of the plants producing the red K6 telephone boxes of Britain, by the mid 1960s they could not carry on. The company closed, and the building was soon demolished. The area went into a spiral of decline with mass unemployment and subsequent social problems. Although a lot of the street furniture produced here was requisitioned and melted down during World War 2 for the war effort in Glasgow, you can still see the work produced here in the ornate iron street lamps in George Square, the lams outside the Mitchell Library, the bridge over the River Kelvin at Kelvinbridge subway station and in whole buildings, such as the iron work of the Kibble Palace in the Botanic Gardens. It is about 7 years since I last walked down Saracen Street, when I spent 12 months working out here. It hasn't changed much in that time. Like Victoria Road or Dumbarton Road this is a high street that is lively and filled with a bustle of local people going about their business. The mural on this wall of a Saracen Street tenement no longer faces a gap site, and a few new buildings are filling some of the many gaps around Possil now. The mural recalls the foundry and industries of the area, no longer here and still the main thing missing from Possil - employment. In the 1920s Adam Laidlaw started producing his Askit powders in this building, an addictive mixture of aspirin and caffeine which was taken by people for everything from headaches to colds, to hangovers and as a general tonic. Everyone over a certain age will be singing "Askit fights the miseries" on even hearing the word Askit. Eventually the brand was bought by a major pharmaceutical company but is no longer produced due to safety fears over its choice of ingredients. Going further down Saracen Street and turning right past the Seewoo Chinese supermarket onto Possil Road you pass the former site of the fantastically named Rockvilla School. 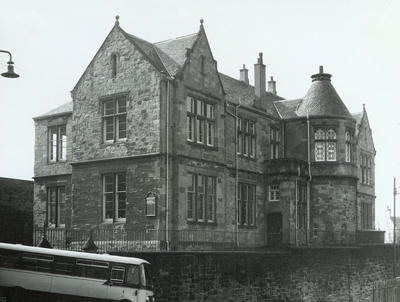 Built between 1874-77 in an area known as Rockvilla in the days before any housing was built here (and later called Hamiltonhill), this school had a roll of up to 650 children. Closed in 1964 the building was B-listed but fell victim to the mysterious Glasgow fires that clear troublesome buildings from the cityscape and it was demolished in 1996. The separate entrances for boys and girls at the bottom of their respective stairwells can still be seen, a strict requirement of the school authorities of the city at that time which looks incredibly silly here when it meant two concentric flights of stairs had to be built. At the top of Dawson Street, behind the site of Rockvilla School is "The Whisky Bond". Originally built as a bonded warehouse for Highland Distillers in 1957 it is now used as offices, studios and gallery space. Glasgow Sculpture Studio have a gallery on the ground floor that is always worth having a look around as they do have imaginative and unusual exhibitions on. Applecross Wharf is home to some of the oldest canal buildings in Scotland. Built as warehouses these whitewashed buildings are now used as the offices of Scottish Canals. Just north of this bridge lies "Old Basin House". Built in 1790, engineer Hugh Baird later lived here and ran several local businesses whilst living here, including the Old Basin Inn on the other bank of the canal. A few walls of this old pub still stand. To carry on south across this bridge you would come to Oakbank Hospital and the Astoria cinema that I have written about previously. Going back to the other end of Possilpark we come to Hawthorn Street. The former Possilpark Tram Depot, built on this site originally in 1901, stands here a shadow of its former self. It was converted into a bus garage in 1958 by its owners, Glasgow Corporation Transport but has been closed since the year 2000. There is a huge amount of empty land lying derelict behind this facade. Just east past the old tram depot is the home of Glasgow Speedway team, The Glasgow Tigers and Ashfield Junior Football Team. Known as Saracen Park when Ashfield Football and Athletic Club moved here in 1937, they share the stadium with the speedway team in what now seems to be called The Peugeot Ashfield Stadium. Ashfield FC were formed in 1886 and have been one of the most successful teams in junior football, the first junior team to win 100 trophies, although at present they ply their trade in the Central League Division 2. The speedway team have been drawing bigger crowds in recent times and have redeveloped the stadium a bit with a diner open 7 days a week. Literally around the corner from Ashfield's ground stands the home of their Possil rivals, Glasgow Perthshire. The Shire were formed in 1890 and play at Keppoch Park, in front of a huge pigeon loft. These two teams can give Dundee and Dundee United a run for their money in having the shortest distance to travel for derby matches in Scotland (they played on the 6th Feb 2016, a 2-2 draw). At the other end of Hawthorn Street where it crosses Balmore Road lies the former Mecca (and after the second world war The Vogue) cinema. If the Astoria was the rough cinema in Possil, this was the posh one. Opened in 1933 in was changed to become a bingo hall in the 1960s. More recently it has been home to the Allied Vehicles garage and a kilt hire shop. With Glasgow expanding in size towards the end of the 19th century and the city's fever hospital at Belvedere being overcrowded, in 1891 Glasgow Corporation bought land at Ruchill to build a new hospital, a public park and a golf course (which is a very decent wee 9 hole course still run by the council/ Glasgow Life). Ruchill Hospital was laid out high on the hill here and the ornate water tower of the hospital has dominated the northern skyline of the city ever since. Designed by Alexander McDonald who also designed the People's Palace, Ruchill Hospital consisted of 16 separate ward blocks which could accommodate 440 patients. It dealt with smallpox, diptheria, measles, scarlet fever and polio. Later a pavilion for dealing with patients with TB was built. There were also service buildings, stables, nurses homes and the staff villas still standing along Bilsland Drive, where the only entrance to the hospital was. The high position of the site required the building of the 50 meter high water tower. As health problems of the city changed the role of the hospital changed with time. It became home to an important virology lab, a place for the treatment of sexually transmitted diseases and had several geriatric wards. In the 1980s, when I was out here as a student, it was the primary centre in Glasgow for dealing with people fighting HIV and AIDS. At that time, when this disease was emerging, Ruchill Hospital felt a rather isolated and frightening place which maybe reflected how the young people who were dying from this illness felt. With hospital re-organisation in Glasgow the city's infectious disease unit was transferred to the Brownlee Centre at Gartnavel Hospital and in 1998 Ruchill Hospital was closed. The land was sold to Scottish Enterprise and plans drawn up to build 500 houses, but none of that has yet come to pass. Many of the buildings here were C and B-listed but have been demolished, as the original developers wanted, when they were declared to be beyond repair. At present the plans are to preserve the fantastic water tower, which now stands in splendid isolation like some bizarre lighthouse. From here I headed along Bilsland Drive to Ruchill Park to enjoy the panoramic views over the city and across to the Campsie Hills. The artificial mound on which the flagpole here stands was made from spoil cleared during the construction of Ruchill Hospital. Ruchill Park has never had a lot going for it beyond the views. On old maps it was called Fir Hill in the 19th century. The football stadium built in a bend of the canal in 1909 at the bottom of the hill, on Firhill Road, gets its name from this. It has become more difficult now to see Firhill Stadium from Ruchill Park with all the new housing on the north side of the canal. Only the floodlights sticking above the houses are clearly visible. Also from the veiwpoint you can see the extent of the new housing being built along Bilsland Drive, meaning this area has changed a lot in recent times, and seems to have more of a spring in its step. As I hopped back on my bike and went back along the banks of the canal towards Maryhill Road at Shakespeare Street I made one more stop to have a look at the Ruchill Church Hall here, designed by Charles Rennie Mackintosh. It is from 1899 and pre-dates the red standstone church alongside it. This is one of his more hidden away works and inside and out has lots of typical Mackintosh details. Did he intend the frontage to look like a startled Transformer robot though? Who knows? Anyway I have written too much already. I enjoyed my day having a closer look at things which I often walk or drive past without paying much attention and I would encourage you to go and do the same (especially for the bacon rolls at Lambhill Stables). Paul, I just relocated in Glasgow (The Gorbals) as a French woman a few months ago, and as i was looking for more historical and hidden information on a city, i found your blog. This is a gem :) It is great and will definitely help me deepen my exploration of a city i am already attached to. Thanks a lot. May I ask you 2 questions ? - You mentioned new immigrants settling in the GORBALS and bollards painted with "wet paint" in French... Do you have more information about any French immigration in the district ? - Do you know if the Cottiers Church (and pub) was protestant or Catholic ? I cannot find any information on it. Bravo for your blog. Thanks a lot for all the good content. Thank you Helene for your comments. The French-speaking immigrants to the Gorbals are among the newest arrivals, mostly from west Africa. As you may have noticed by now, religion in Glasgow can be complicated. Cottiers bar was built in 1865 as the Dowanhill United Presbyterian Church, one of the branches of the protestant church at that time. Later it was known as Dowanhill Church, after union with the Church of Scotland in 1929. It continued as a church until 1984. There is the large Catholic graveyard I described above, St Kentigern's cemetery, but there is no church attached to it. There is a small, enclosed graveyard near the crematorium building, then the larger St Kentigern's Catholic graveyard beyond that. On the other side of the crematorium is the Western Necropolis. ALl of these graveyards have war graves, and a couple of larger war memorials with names on them. If you had a name and wanted to find a specific plot, at present you would need to go into the Mitchell Library in Glasgow to look up the paper records for the cemetery. They have been planning to pt it online for a while, but I do not think it is available yet. Hi i was born in possilpark(Closeburn street) 1952 and moved to Lambhill(Eynort street when i was 8 years old and have great memories of that time thanks for your writings of the areas i thought these were great and toke me back a very happy time in my life and told me things i did not know about my childhood playground , i often think back with fond memories. Thanks again. Joe Hunter. Found your page whilst looking for info on Western Necropolis / Lambhill cemetery. Many thanks for all the information about the surrounding area. I have lived in Glasgow for many years but was woefully ignorant about much that you have mentioned. The detailed information you have provided is much appreciated. Thank you. This was a great blog. I lived above the canal too, at the bridge over bilsland drive, but I was wayward and always having adventures following the canal all the way to Bishopbriggs when I was about 10. The canal went on fire next to the factory one day in the late 70s. There was a giant derelict church near NK school which I discovered had something to do with the Temperance movement. I climbed the organ pit and survived. I also used to break into factories to have a look. Some had massive feral cat populations. I would love to know what that building is next to the Munns vaults pub on Mary Hill rd. I used to eat the brambles on the canal bank behind there (iron stomach) . It's been bricked up for decades. Any idea? Is it still there? I wonder if the people who now live around these areas have any idea of the total poverty people used to live in around those areas. Hi Punter, I lived at 61 Eynort Street from 1951 to 1963 when I emmigrated to the US with my mother brother and sister. I have great memories of growing up there and your blog brought back more than I remembered. Well done and thank you. I was looking for this kind of information. Thanks a lot dear. Your Blog is too good.I like your post nice job..